A retro style kitchen is a good way to give your home a retro look. There are a few modern reproductions of classic designs available. The original retro kitchen dates from the 50s. It was a concept developed further in the 60s. In the early sixties, kitchens were either made from wooden units that had to be painted or from metal, such as steel, as produced by Allied Iron Foundries in their Leisure range. Throughout most of the sixties new houses had wooden kitchen units that needed to be painted. The fitted kitchen became a must-have status symbol in the 60s. The material that transformed the fitted kitchen and made it something ordinary people could consider was Formica. Formica panels were easy to clean and maintain and the surfaces were hygienic. It was a revolution in the home. 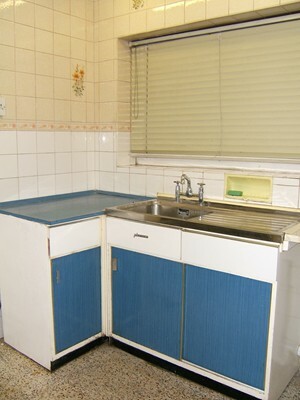 This Leisure Line kitchen from 1962 (right) shows the popular pastel blue colour that was used in many kitchens during the early part of the sixties. The bright red work surface embodies some of the fun colours that were to become more popular later on in the sixties. The pine panelling is quite forward looking for 1962. Here there is mild reference to Scandinavian style offset by the modern style copper light fittings. It is prophetic of what was to come. Later, the Victorian country kitchen became the trendy kitchen of the sixties. Finally, it became every housewife's choice in the late seventies and totally dominated the market from the eighties to the late nineties. Rarely were women (and even less likely men) shown actually working in the kitchen. Here the owner has done her work, presumably so much more efficiently in her new kitchen, that she has time to relax in a hammock in the back garden! This kitchen, dating from the mid-sixties, shows Formica covered units. The shell still had to be regularly painted though. Blue and white were a popular colour choice in this era. Venetian blinds were a popular sixties kitchen accessory.